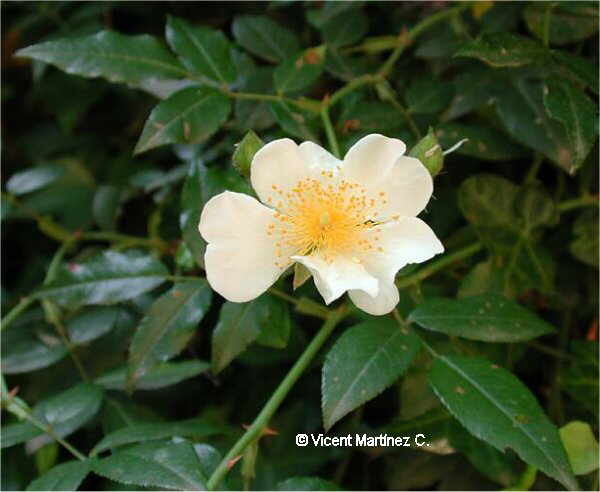 Perennial bush of the Rose family -Rosaceae- up to 2 m. tall. Vine shoot like stems, green, pendulous, with strong hooked prickles. Composite leaves; 3- 4 pairs of toothed, oval leaflets. Solitar flowers or in 1-4 corymbs. White or pink, till 4 cm wide with numerous stamens and sepals which fall before the fruit is ripe. Fruit 2 cm wide, dark red (Hips). Sometimes there are some protuberances over the branches, which are produced by the plant itself to locate the larvae of the insects Rhodite rosae. In woods, hedges and by the side of the roads.